It is my firm belief that any recipe book compiled by Methodist Church Ladies or Temple Sisterhoods is good. 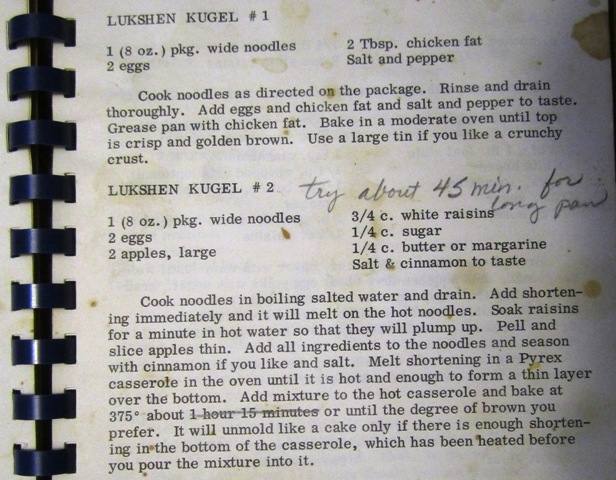 Take, for example, JPI Family Favorites Old & New, a fundraiser cookbook project by the members of Jewish Parents Institute in Detroit in 1973. It includes not just one, not just two, but five delicious recipes for kugel. I am only going to show you two, and I recommend the second. As you can see from the condition of the page, that’s the one that got used a lot at my house. You were expecting maybe potato latkes? Sadly, I’ve never been any good at making those. Mine are burnt outside and underdone inside. Not delicious. Besides, I don’t want to be responsible for the carnage. Grating potatoes by hand is a dangerous business. True, kugel is not a traditional Chanukah treat, but I’m not a traditional sort of person. Kugel is an excellent treat, and I’m all about that. I like to make my sweet kugel with sour cream and cream cheese, but thank you for the addition of apples. I’ll try it. Happy Hanukkah! I’ve made one with cottage cheese or ricotta – must try the cream cheese. I’ll put apples in almost anything at this time of year, or cherries.